It is composed of one MC-LL auger weighing machine and one 5000D/5000B/7300B/1100 vertical filling packaging machine, which is especially suitable for metering and packaging ultra-fine powdery material with heavy flying dust. It integrates the functions of metering, bag forming, filling, sealing, printing and counting. 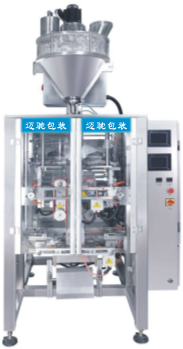 This machine equipped with advanced level switch, dust extraction device and anti-static device (optional) which effectively solves the problems appeared during the powdery material packaging process. Medicine, food, daily chemical industry, agrochemical, architecture material industry, can also be customized according to requirements.